I've decided to post a few "classics" from long before anyone paid attention...as opposed to now, when 30 people pay attention. I originally posted this on 12/02/2007 at 10:04 PM which you can find here. I'm reading through the Concepts manual again as mentioned on last week. I'm going to make a small effort to post some of the key concepts here over the next couple of weeks. If you've read through the Concepts Guide before, this can serve as a brief refresher. If not, good, you're exposed to something new. 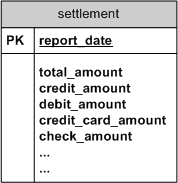 This section describes the rules that can be applied to table columns to enforce different types of data integrity. Null rule: A null rule is a rule defined on a single column that allows or disallows inserts or updates of rows containing a null (the absence of a value) in that column. Unique column values: A unique value rule defined on a column (or set of columns) allows the insert or update of a row only if it contains a unique value in that column (or set of columns). Primary key values: A primary key value rule defined on a key (a column or set of columns) specifies that each row in the table can be uniquely identified by the values in the key. Referential integrity rules: A referential integrity rule is a rule defined on a key (a column or set of columns) in one table that guarantees that the values in that key match the values in a key in a related table (the referenced value). * Restrict: Disallows the update or deletion of referenced data. * Set to null: When referenced data is updated or deleted, all associated dependent data is set to NULL. 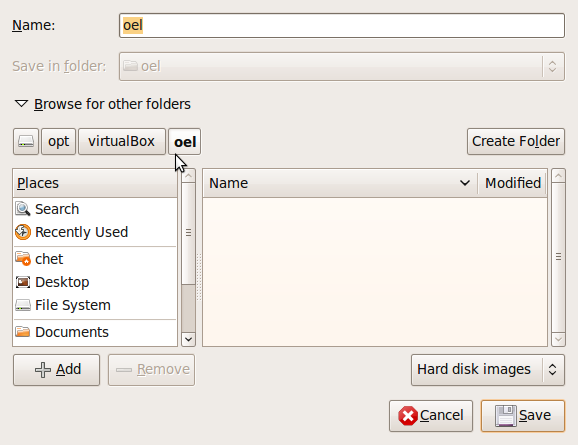 * Set to default: When referenced data is updated or deleted, all associated dependent data is set to a default value. * Cascade: When referenced data is updated, all associated dependent data is correspondingly updated. When a referenced row is deleted, all associated dependent rows are deleted. Complex integrity checking: A user-defined rule for a column (or set of columns) that allows or disallows inserts, updates, or deletes of a row based on the value it contains for the column (or set of columns). ENABLE NOVALIDATE means that the constraint is checked, but it does not have to be true for all rows. This allows existing rows to violate the constraint, while ensuring that all new or modified rows are valid. 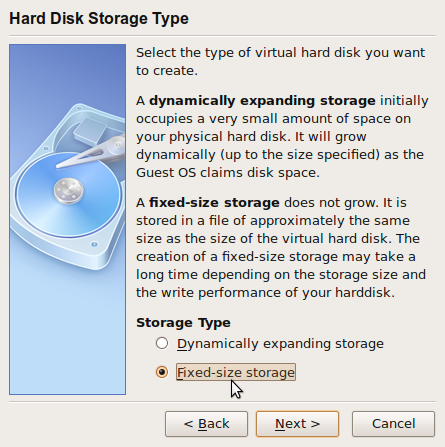 This is a great tool for legacy systems. You have data in the column(s) that you can't really do anything with, but you want to insure that all future data that goes in that particular column(s) matches the parent key. Of course the ideal is to somehow clean the data up, but you don't always have that option. 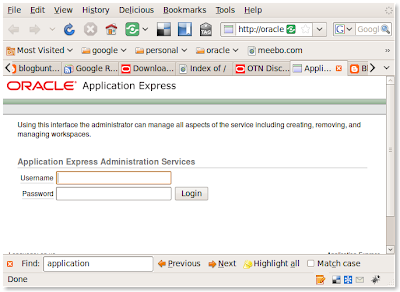 This is a good first step towards to overall cleanup of your legacy system. This is more for my own edification than anything. I always forget which place the ClearCache inhabits. Link to the documentation is here. Much better. The question still remains as to what's going on in the background. 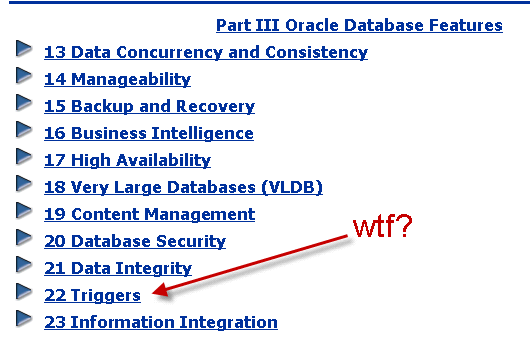 Until now, I had never thought that white space mattered in anything Oracle. Very strange. Maybe I can get Miladin to dig through the internals and see what's really going on. Shoot me, I couldn't let this go. Plus, I needed a reason to test drive my new sandbox. Note the white space there. I like putting a space after a parenthesis as I believe it makes it slightly easier to read. What's the lesson here? Well, if doing analysis, you can't just depend on using the DESCRIBE command from SQL*PLus to see what is required and what is not. Of course you can't depend on that for everything. Interesting "problem" none-the-less. In a continuation from a previous post, PL/SQL: Split URL Parameters, I give you the key/value splitting! (cheese, I know...I'm bored). I could easily do this using PL/SQL tables, but I have future plans. This will eventually turn into a Function, but I'm just doing some smoke testing now to get the logic right. More extensive testing will be performed in the future with SQLUnit. I still haven't figured out the best way to grab the last token without appending the delimiter onto the end. It feels like a kludge, but for now, it works. Regular expressions would be the best fit here. Until I learn them (yes, I hear you, "Isn't this the perfect opportunity? "), I'm going to do it the hard way. Finally, just printing out to the console so I can see the results. Now I just need to wrap this up into package form and I'm all done. That will be another post with the unit tests provided. So after rereading this post, I realized that I just confused it with the previous post on splitting URL strings. Probably the best solution would be to combine these 2 functions, or at least pipe out the key/value pairs from the main function (previous post). Did I catch a niner in there? Back at COLLABORATE, I met one Patrick Peralta, member of the Coherence team (reason #109 to go to conferences). 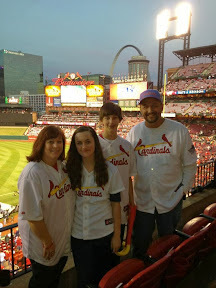 I spent about 2 hours with Mr. Peralta that day and had quite a bit of fun. I learned a couple of new tricks (JRockit for one) and got a slightly better understanding of Coherence. I emphasized "slightly" because I still don't quite know how to use it. Caching data, I get that part. I guess I do understand it from a high-level perspective...it's the where part that I haven't quite grasped yet. One thing I asked Mr. Peralta to do for me was to right it up, blog it. Show me (us) how and when to use it. Through twitter, he's shared with me some links. Specifically this one on how to define a Data Grid. Finally (he did not mention that he likes to procrastinate), he's written something up, An Introduction to Data Grids for Database Developers. * Is it OK if the caches on your app servers are out of sync? * What happens if one of the app servers wants to update an item in the cache? 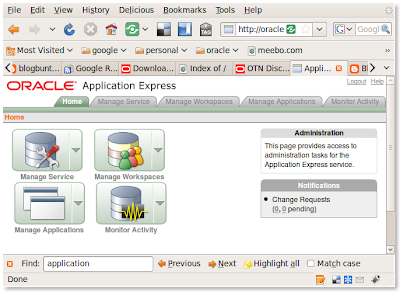 * How do you minimize the number of database hits to refresh the cache? * What if you don’t have enough memory on the app server to cache everything? It's a very interesting technology. I would highly encourage you to click through and give it a go. Leave comments here or abroad. I manually count the columns and they're the same. Run it again. I then cut and paste both "halves" of the INSERT statement into excel so I can get a row-by-row compare. Wouldn't it be cool if you could do something like this though? I did solve my problem, I was missing the opening parenthesis in the VALUES clause. 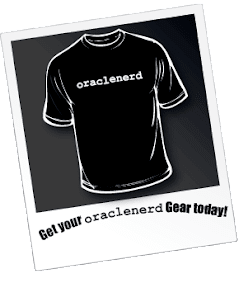 I created an "Idea" over at Oracle Mix, check it out and vote for it here. I've always had this phobia of anything to do with strings. Might be because I find it hard to think that way...and by "that way" I have no idea what I'm talking about. Of course that means I have to go through the loop at least 18 times. How could I loop less? OK, that helps. So what can I do with that? Voila! My own URL String Tokenizer. UPDATEs in OLTP: A Design Flaw? Should you do UPDATEs in an OLTP environment? The answer is maybe, or it depends, of course. When I ask this question I ask it in relation to INSERTs. There is a difference between creating a record and updating a record. I think it comes down to a design decision. A session defaulted was created with a 30 minute window. Each page the user would hit would update the END_TIME to SYSDATE + 30 Minutes. If they had no activity for 30 minutes, the END_TIME would be less then the current time (SYSDATE) and they would be logged out. This table did exactly what I needed, UPDATEs worked perfectly here. What if I wanted to track page hits though? Could I do that with the current table? I could possibly add PAGE_ID or something I suppose, but then I would have to write this "complicated" query to find the first START_TIME and then compare that with the last END_TIME. Kind of changes the meaning of the table right? 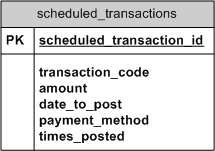 You have a table of scheduled transactions or some sort of recurring billing. You use this table by having a job that looks at the DATE_TO_POST, takes those and attempts to post them. If there is a problem, you update the DATE_TO_POST column to the next date/time (based on rules somewhere) and you increment the TIMES_POSTED counter. That doesn't sound so bad right? If you don't have any processing or billing failures, it's not. But if you do, you lose some valuable data, in my opinion. First, get rid of the TIMES_POSTED column. You don't need it. Create a record for every single transaction you have posted. This obviously changes the meaning of the table and will force you to change your code. Here's why it's good though (to remove the UPDATE): You now have a single record for every attempt. 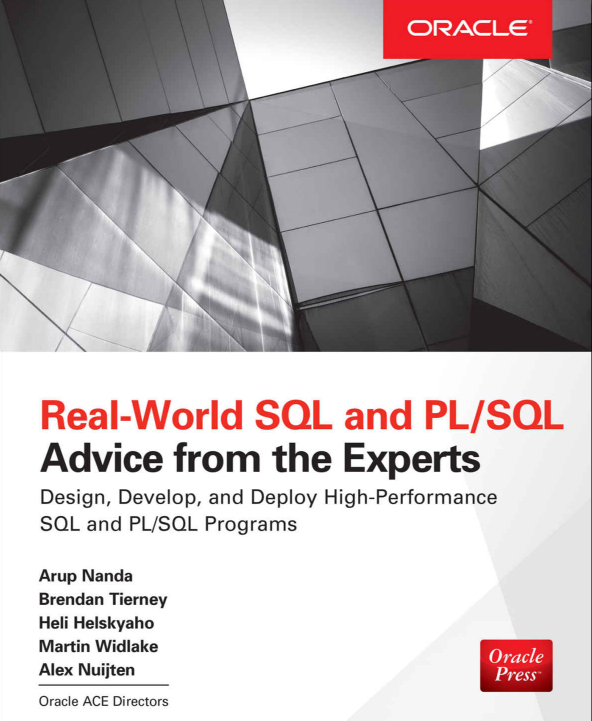 Your reporting off of this becomes much easier and is performed with SQL. With the UPDATE, you have to maintain some PL/SQL code ( TIMES_POSTED + 1). With the INSERT, you don't perform a calculation at all. Now you have INSERT statements as opposed to one or more UPDATE statements. Reporting tools can then handle the pivoting or whatever else you want to do to the data. UPDATEs in an OLTP are not a flaw, but when about to write one, think of the implications. Is that what you really want to do? Wouldn't you rather just do an INSERT and be done with it? I've been tasking with making some fairly drastic changes. When I say drastic I mean that I'm changing the name of a table and updating all of the dependencies. The drastic part comes in because there are about 11 Trillion dependencies. So not to affect the other developers while I hammer this out, I created my own instance and one-by-one brought over the necessary objects (and their dependent objects). I know there are other ways to do this, develop in your named schema in the development database just changing or repointing the objects to your own. 3. I have ApEx installed (development doesn't...yet). Anyway, one procedure had an INSERT into our reporting environment (another database) so it wouldn't compile. 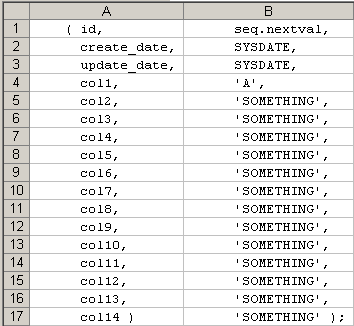 It used the INSERT INTO [table]@database_link syntax. How can I replicate that? I know I've seen or read the solution somewhere, but I decided to do without Google this time to see how long it would take me. WIN! Does it work though? Most of you know I'm a Linux n00b. I have no apologies for that...at least I'm trying right? 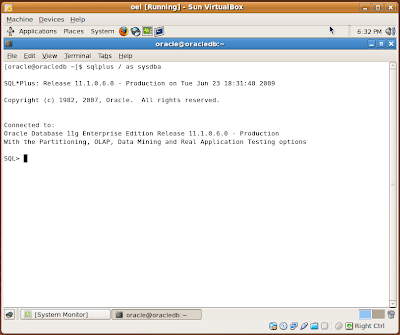 I unsucessfully attempted to install Oracle on Jaunty Jackalope (9.04) so I decided to use VirtualBox and Oracle Enterprise Linux. 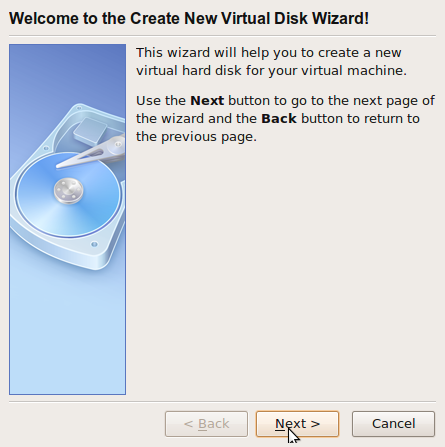 I'd successfully created a Windows Vista Ultimate virtual machine, off to try my second. 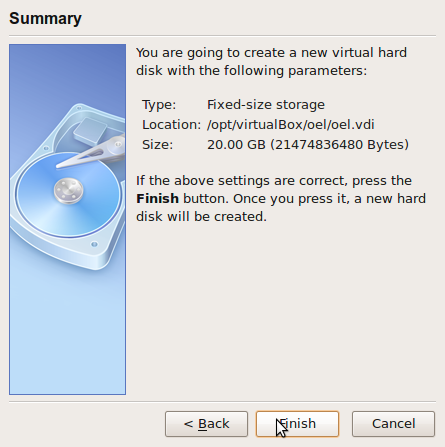 At first, I began to search for problems with VirtualBox. 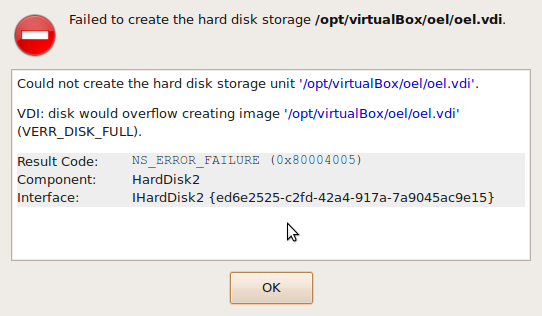 I tried created a smaller disk, 2.0 GB, and it worked. So I knew I had a space issue (well, I think I knew). 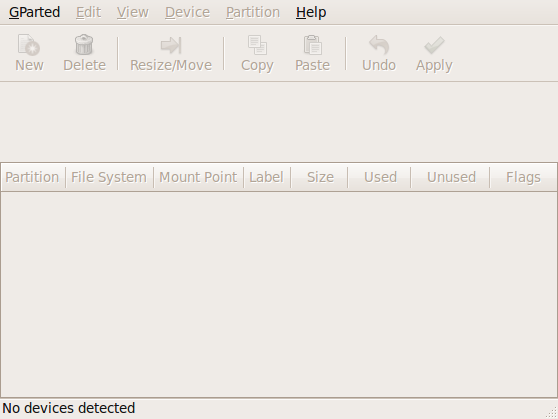 So I've tried search on "ubuntu fdisk nothing" and get nothing. So I'm asking you fine folks...either help me out or point me to the manual (RTFM!). Links are helpful. Answers are the most helpful. Something. I don't want to reinstall again but will if I have to.